It had a good run, and can now take its place (history will judge its significance) in the evolution of the 21st Century Library. It died because it was never anything more than librarians “playing” with Web2.0 technology, and it lacked a coherent framework for incorporating anything into creating a 21st Century Library. Walt Crawford’s most recent essay at Cites & Insights: Crawford at Large 11:2, regarding “Five Years Later: Library 2.0 and Balance” provides an extensive review of Library2.0, and what has happened to its voracity over the past five years since it was introduced. Since many of my Posts have been a criticism of Library2.0 in the sense that it never was anything more than “playing” with Web2.0 technology by librarians, I was very interested in his perspective, and retrospective. Was there ever a clear, useful, consensus definition of Library 2.0? Don’t quote Wikipedia at me: I will tell you with 100% certainty that the current shape of that article is at least partly due to some of us lacking the tenacity and patience to keep pushing at it, and even then “loosely defined” appears before the non-definition. My opinion is that Library2.0 died for the reasons already stated; it was never anything more than librarians “playing” with Web2.0 technology, and it did not offer any coherent framework for building a 21st Century Library. 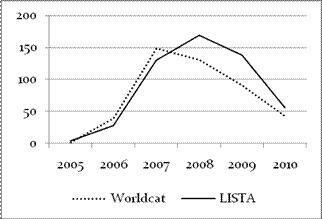 Crawford’s search results of “Library2.0” publications in Worldcat and LISTA, the free version of Library, Information Science & Technology Abstracts offered by EBSCO, over the past five years revealed a graph with the following results. IMHO the 2007-2008 peak was spurred by Helen Blowers 23 Learning 2.0 Things. It literally went around the world being adopted by over 1,000 libraries as THE training tool for librarians to learn all about Web2.0 skills. One of her tenets included “playing” with the various Web2.0 tools, which was offputting to some, because it lacked any discernable objective beyond “playing”. It also died for lack of a coherent framework for incorporating any of it into creating a 21st Century Library. One of the many fallacies in virtually every profession and business endeavor is that one solution fits all. IT DOES NOT! Not everything implemented by Library A is adoptable by Library B successfully. Every organization is unique – INTERNALLY. While external influences (in the case of the 21st Century Library they are technology advances, education reform, and societal changes) may be virtually the same among the library community, internally is where implementation of a model solution either succeeds or fails. But…and it’s a big but…the Library 2.0 “movement” also had more than its share of Big Deal Projects and Manifestos, a whole bunch of universalisms (“every library should…” and “every librarian must…”) and a fair amount of better-than-thou moments. It also involved more intergenerational misunderstanding and quarrels than should have been the case. I totally agree with Mr. Crawford on these points. Nothing lasting came from all the “overplanning and multidivisional task forces” associated with Library2.0 projects – AGAIN – for lack of a coherent framework for creating a 21st Century Library. Crawford quotes another source that wasn’t clear, but which is worth citing here to emphasize the point it is illustrating – technology for the sake of technology is another reason why Library2.0 is dead. Just because a shiny gadget or tool is available, it doesn’t mean that there is a need for it in each library. “Anytime we fetishize the container over the information we’re creating a golden idol,” writes Joshua Neff, extending the “sacred cow” metaphor. Amy Buckland agreed, writing, “I’m always amazed that libtechs are so enamored of tools long before they come up with uses for them. Then we try to shoehorn library services into a tool just so we have it.” Experimenting with low-cost or no-cost tools like Twitter will only cost staff time, but implementing expensive (think federated search) or complex-but-free technologies (think Drupal) because it’s the cool thing to do can be a very costly lesson for a library to learn, in terms of budget, staff time, morale and user satisfaction. It died because it was never anything more than librarians “playing” with Web2.0 technology, and it lacked a coherent framework for incorporating anything into creating a 21st Century Library. Stay tuned, because I intend to provide the coherent framework for creating a 21st Century Library that Library2.0 lacked. Obviously, I’m assuming that there will be several parts to this subject (since I didn’t actually get too far “on topic”), so there will be more. I have NEVER considered myself a “progressive” and certainly not an “activist”, both terms with unpleasant connotations to many in my generation. But, I am seriously upset and concerned at the lack of conversation among the librarian profession in general regarding the 21st Century Librarian, and by a lack of leadership of this conversation within ALA specifically. The justification for my upset and concern was borne out by a recent speech at “A 21st-Century Vision for Libraries” conference held in Islamabad, Pakistan last month. The Keynote address by Leonard Kniffel, Editor and Publisher of American Libraries, addressed Libraries Now More Than Ever. SERIOUSLY? THAT IS THE 21ST CENTURY MESSAGE FROM ALA? IMHO this is a painful admission (that unfortunately Mr. Kniffel doesn’t even recognize as such) that ALA is not only NOT answering the question (otherwise it wouldn’t be constantly being asked), but that ALA’s “message” has not changed in over 100 years. My first ALA conference was in Chicago in 1995, and my last ALA conference was Washington, D.C. in 2007, and the session topics and general topics of conversation had not changed! In 12 years – NOTHING HAD CHANGED! STAGNATION! From Mr. Kniffel’s remarks, it sounds to me like ALA doesn’t even recognize that we are in the 21st Century, or that current environmental factors have changed the way libraries MUST do business to remain relevant and survive. Totally unlike IMLS, “an agency that is funding the library” with MAJOR $$$$, that has already recognized that “… the delivery of library … services will be impacted by technology, education reform, and societal … changes …” (Dr. Anne-Imelda M. Radice, Director, Institute of Museum and Library Services) and that has published The Future of Museums and Libraries: A Discussion Guide. IMLS wants to help GUIDE the discussion! Out of over 3,500 words, Mr. Kniffel’s only 21st Century words of wisdom were; “Information specialists can no longer afford to operate passive repositories. They must be aggressive navigators and aggregators who anticipate the needs of their clients. Our schools cannot be only schools of LIS, they must be schools of LIST: Library and Information Science and Technology. No librarian can afford not to graduate from an LIST and know how to create a website, how to publish an e-newsletter, and how to utilize social networking to deliver library service.” OK. And, which graduate schools are offering that education TODAY? Mr. Kniffel speaks as if he is revealing a great and wonderful unknown treasure stored within your local librarian when he attempts to visualize the future library. So what is the future for libraries? What is our vision for contemporary libraries going to be? Stop for a moment and imagine something. Imagine that you have a personal librarian, one who can tailor a daily reading delivery to your specific tastes and needs, showing you the latest and most interesting writing on your work and for your pleasure and delivering it in a format that allows you to read it onscreen, download it to an e-book, or print it out. The day is coming for us all. In fact, you can start planning now for how you are going to actively deliver information in various media to your community of users before they even know they want it. He is obviously unfamiliar with “push technology” (explained WAY back in 1997 by Dr. Kenneth W. Umbach, California Research Bureau, for the California State Library), or publish/subscribe news aggregator services like Google Reader, or HyperSuper personalized news aggregator, or any of a myriad of aggregator technologies listed at NewsOnFeeds, NOT to mention simple RSS feeds, and other basic technologies already in fairly wide use in local libraries. 1. They inform citizens and help them find not just information but accurate and authoritative information and knowledge. 2. They break down social boundaries by being open to all. 3. They level the playing field between the haves and the have-nots, the rich and the poor. 4. They value the individual and independent thinking and learning beyond the classroom. 6. They open children’s minds to the world around them. 7. They return high dividends on a relatively small investment. 8. They build communities and can be the intellectual centers of the communities they serve, whether that is a town, a university, a school, an organization, or a business. 9. They challenge you to examine controversies, to understand, and to make your own decisions. 10. They offer opportunities for lifelong learning. 11. They provide a safe haven, a sanctuary. 12. They preserve the past, the record of human existence. The answer is: “Maybe not all 10 year olds today, but VERY SOON!” And how is ALA preparing librarians to deal with that new wave of information literate customers? With a pat on the back and saying “Keep up the good work. You are very valuable.”? WE KNOW WE ARE VALUABLE! WE NEED SKILLS TO PROVIDE 21ST CENTURY SERVICES TO 21ST CENTURY CUSTOMERS THAT DEMONSTRATE THAT VALUE! Clearly Mr. Kniffel is out of touch with the 21st Century Library requirements or 21st Century influences driving those requirements. sad………………. I much prefer progressive lists of 21st Century librarian skills like AASL has offered ( 21st Century Skills in Action in School Libraries), like SLA has offered (Special Libraries & 21st Century Competencies), and EVEN 23 Learning 2.0 Things. I also prefer to listen to implied experts who know what they are talking about in today’s reality, not yesterday’s glory. So, I never saw myself as a “progressive” or as an “activist”, but I’m committed to this 21st Century Library effort. So, how do you get from where your library is now, to become a 21st Century Library? Good question. Huge question, but one that deserves an answer. Simple answer: develop a strategy. Hopefully, your library is using a strategic plan to guide your activities and resource allocation to support those activities, which in turn accomplish objectives, goals and eventually your library mission. 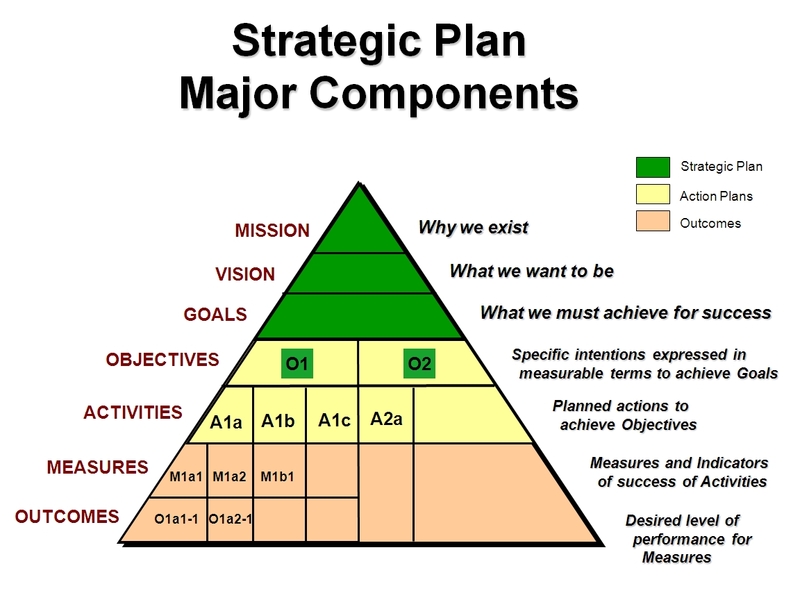 The below diagram outlines the essential elements of a quality strategic plan. If someone has a better approach to beginning to move toward becoming a 21st Century Library, I would love to hear it. A strategic plan provides ALL of the elements necessary to make it happen, not just allow it to happen, but to MAKE it happen. Without a strategic plan any organization will flounder because they have no rudder to guide their activities toward a goal, no system to allocate critically limited resources to complete activities that achieve goals and objectives that ultimately achieve the mission. Allocating resources here and there as current pressures sway decisions leads nowhere, except to the expenditure of those resources without accomplishing any specific goals. Think about it. I’m interested in hearing from anyone who has already done any of this hard work, or has done it another way. What is Library2.0 and Library2.0+ ? I think Library 2.0 is used to describe two concepts. One is applying Web2.0 at your library. The other is the flexible, nimble, evolving, user-centered library, kickstarted by Web2.0 concepts and attitudes. One day the second will have its own name. To me, there are two concepts called “Library 2.0″ – at the moment more or less covering the same libraries doing the same thing, but which will diverge at some point. The second concept will one day need its own name. I have buzzword fatigue and I’m happy to call it Library2.0 for now, but only for now. To differentiate it here, I’m calling it Library2.0+, but I think it deserves something that will date it less and is friendlier. In the first concept, Library 2.0 definitely involves the elements taken from Web 2.0 and the attitudes and expectations it brings – but not all of the time and not in every institution if it doesn’t fit their community. So, one version of Library2.0 is “Web2.0 in a library”. The second concept involves some of what we have always done, and some rethinking. Web2.0 is a catalyst, but not the only element of this. For years, libraries have worked in a collaborative, user focused way, implementing high usability standards – we are already Library2.0+ in some ways. Some of Library2.0+ is tossing out a few of our traditional core functions because they have been replaced (e.g. Google and reference work – not quite!) or sharing our core functions (e.g. Google Scholar). We are putting centre stage previously unnoticed functions. The academic library as study hall and social space is an example of this. This fits in with Laura’s idea of “timeless adaptability”. Ideas like “going where your users are” have been sparked by Web2.0 that created forums and spaces where it’s possible to interact online instead of waiting for our users to come to us. Library 2.0+ extends “going where the users are” beyond our PCs – like Ryan’s suggestion in his Top Ten Zero-tech Library 2.0 “no brainers” for Public Libraries that we volunteer in the community. Web2.0 brings us the informal voice of blogs and web site architecture focusing on the users’ needs. Library2.0+, sparked by this change, is applying it elsewhere and takes it further. We are changing signage, re-writing paper forms, rearranging our collections, reconsidering our overdue policies and even how we talk to our users. I suggest that the term 21st Century Library may be that term. With the emphasis on 21st Century Skills in education that has been progressing for several years now, it seems that at least school and academic libraries are moving in that direction to support those efforts, and develop services to meet the needs of their staff, faculty and students that support the 21st Century education model. AND, if we in the public library sector think about it, even briefly, we will recognize that many of our patrons are, or will be influenced by that new education model. Our Millennial patrons are products of an education system implementing 21st Century Skills. It’s no stretch to imagine that those patrons will never flock to the public library if they are confronted by a 20th Century services model.